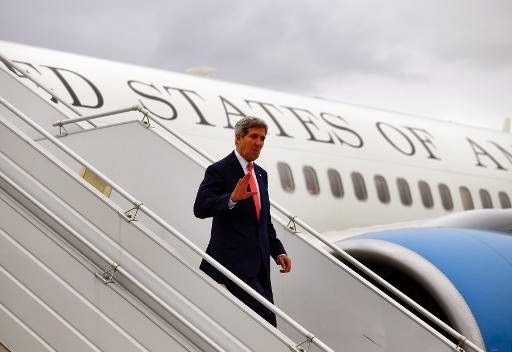 US Secretary of State John Kerry has stressed that no agreement has yet been reached on Iran's nuclear programme, as he arrived for key talks in Geneva. He has joined the UK, French and German foreign ministers for unscheduled talks with Iranian representatives. Under a deal that has been floated Iran is expected to halt some enrichment activity for limited sanctions relief. Israel's PM said he "utterly rejected" such a deal and that his country would not be obliged to abide by it. A nuclear deal of any sort has never appeared this close. For the long run, everything hinges on the issue of Iran's right to the nuclear fuel cycle, which may or may not be sidestepped at this point in the negotiation process. For Netanyahu, the days where President Ahmadinejad made things easy with anti-West public tirades are over. There are those that contend the Israelis are heavily reliant on an enemy to draw attention away from their expansive colonial project in the Levant at the expense of the Palestinians and intentionally stalled Middle East peace efforts, as well as maintaining a special, exclusive relationship with Washington. Judging by the Israeli Prime Ministers recent behavior, such insecurities are on full display. The problem in the West is that they love losers and oppressed. For once Iran is trying to appear as needy and cooperative. That has offest the opponents. It is not just Israel, Arabs are also alarmed. Their prosperity especiallu UAE etc has largely achieved from marginalisation of Iran. They know that once Iran and US rebuild relation (which I guess will be a green flag for the rest of the World), Arabs would have no other chance. It is not in the interest of Iran to worry about inter semite (meaning Jews and Arabs) relatioship. Iran hasenough problem of its own. The situation is extremely complex. We have AIPAC, Arab and Iranian versions of AIPAC who would love to halt this Iran-US get together. If and when that happens the semitesand others will have nothing to moan about. That will be the end of IR aswe know and hopefully Iran can forget this dreadful stain in her history. The task of rebuilding the country and getting rid of the barbaric software (Islam) will be enormous. You have to be in the Country to realise how much the new generation is brainwashed to believe in those mozakhrafat! I find Natanyho’s comment amusing if not pathetic. He thinks Israel, as the country of the god chosen people, should have the same right of veto on EU’s foreign policy, as it has with US! Israel has amassed enough nuclear warheads to destroy half of the world, if it needed, to hold on to its illegal occupation of the Palestinian territory, but assumes no right to peaceful nuclear power for any other country in ME.